Click the File > Export to clipboard from the menu or the Export to clipboard tool button. This will create an image snapshot of the current design and will place it on the clipboard of your operating system. You can then paste it to Word, PowerPoint or other documents that support image files. 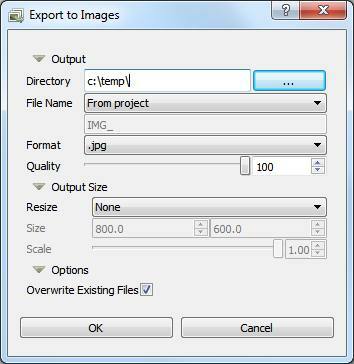 Click the Export to Images to activate the export dialog box. Select an output directory, a file naming method, an output file format and click Ok.
Optionally you can resize the output images to new dimensions by setting the resizing method, the dimensions or the scale. Directory: Selects the output directory where the images will be saved. Custom name: Allows you to specify a custom file name. MockupUI will append the index of the image for each output file (Image#1.png). From project: Uses the names visible in the header of the design browser. By selecting a Resize method MockupUI will automatically scale the image up or down in order to fit the specified dimensions. Scale: Use the Scale parameter to specify a custom scale. Fit: The image is automatically scaled to fit inside the rectangle of the specified size. All the output images will have the same size. Transparent or black bands may be visible on the sides. The aspect ratio is preserved. Fit Exact: The image is automatically scaled to fit inside the rectangle of the specified size. Output images will not have the same size. No lateral bands are added. The aspect ratio is preserved. Stretch: The image is automatically stretched to fit the specified dimensions. The aspect ratio is not preserved. Fill: The image is automatically scaled and cropped to fill a rectangle of the specified size. The aspect ratio is preserved. Overwrite Existing Files: if checked, MockupUI will overwrite the existing files. Otherwise a copy number is appended at the end of the file name (Design1, Design2, ...). MockupUI allows you to compile designs and notes into complete UI specification documents. You can export the designs to Word, PDF and HTML documents, one design per page. Select File > Export to Document or click the Export to Document tool button. 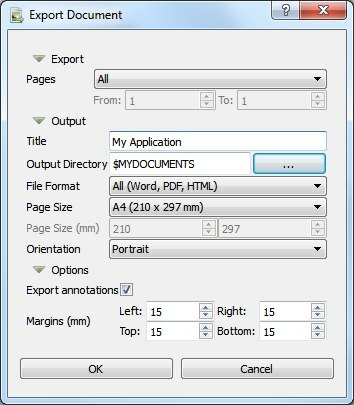 A dialog box will open allowing you to select the document name, output directory, page orientation and page margins. Specifies the designs to export. Specifies the name of the output file and the document's title. If a file with the same name exists it will be overwritten. Selects the directory where the document will be saved. If a file with the same name exists it will be overwritten. Selects the output document file format. + All: will generate three files, Word (.docx), PDF and HTML. + Word: will generate a Microsoft Word docx file. + PDF: will generate a file in portable document format. + HTML: will generate a HTML file. Specifies if the annotations should be exported to the document. If not ticked, only images will be exported to the document. Specifies the page margins in millimeters.